Explanation: A mere 50 light-years away, young star Beta Pictoris became one of the most important stars in the sky in the early 1980s. Satellite and ground-based telescopic observations revealed the presence of a surrounding outer, dusty, debris disk and an inner clear zone about the size of our solar system -- strong evidence for the formation of planets. Infrared observations from European Southern Observatory telescopes subsequently detected a source in the clear zone, now confirmed as a giant planet orbiting Beta Pic. The confirmation comes as the planet is detected at two different positions in its orbit. 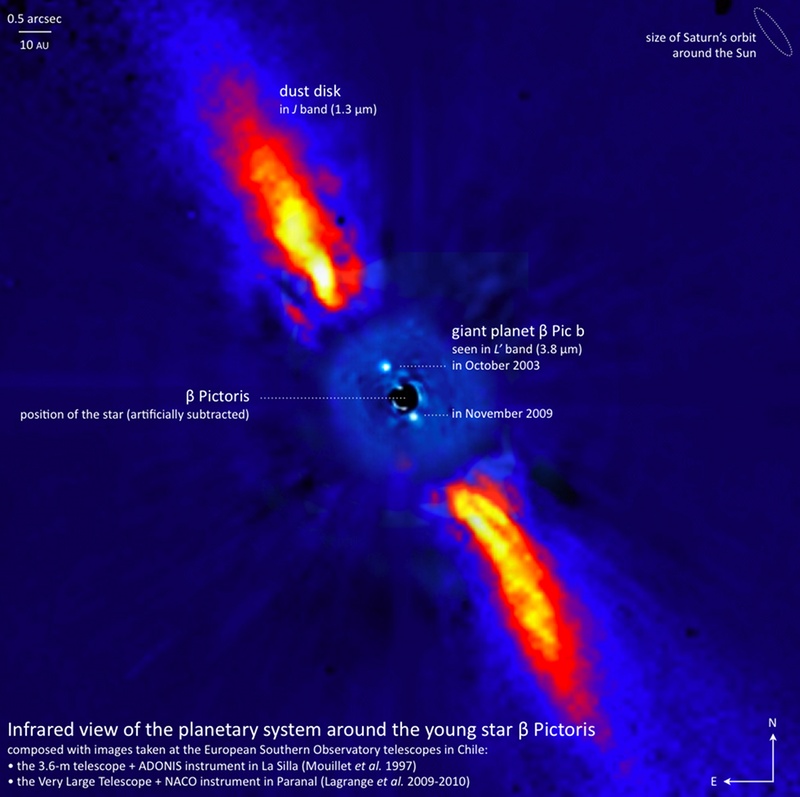 Designated Beta Pictoris b, the giant planet must have formed rapidly as Beta Pic itself is only 8 to 20 million years old. With an orbital period estimated between 17 and 44 years, Beta Pictoris b could lie near the orbit of Saturn if found in our solar system, making it the closest planet to its parent star directly imaged ... so far.